Besides "don't you miss bacon?! ", the question that I was asked with greatest frequency during veganuary was "but where do you get your PROTEIN?" This is probably due to the fact that one of the biggest misconceptions surrounding a vegan diet is that it does not provide enough protein. The word protein is stereotypically associated with a slab of red meat or a chicken breast, but there are plant-based protein sources aplenty. I was spoiled for choice when seeking out protein-rich foods during veganuary, so today I will be sharing just a few of them, all in the name of mythbusting! One thing that all veggies and vegans should be aware of when seeking plant-based protein sources is the difference between COMPLETE VS. INCOMPLETE PROTEINS. Most meat-based protein sources are complete, meaning that they contain all of the requisite amino acids for our bodies to maximise protein absorbtion. This is not the case for some plant-based protein sources, they are known as incomplete proteins. However, all is not lost for us veggie types! Different vegetable proteins can be combined easily to turn vegetarian and vegan meals into complete protein sources. Let me show you how! ... The more you eat, the more you (AND we'll leave it there). Rude rhymes aside, black beans are an amazing source of protein. 4oz of black beans actually contain the same amount of protein as 4oz of ground beef! What's more, when compared to the beef option, beans have fewer calories, are considerably lower in saturated fat, and are high in fiber. When eaten alone, black beans are an incomplete protein source, but when combined in a meal with rice, the rice and beans complement each other and form a complete protein source - hooray! 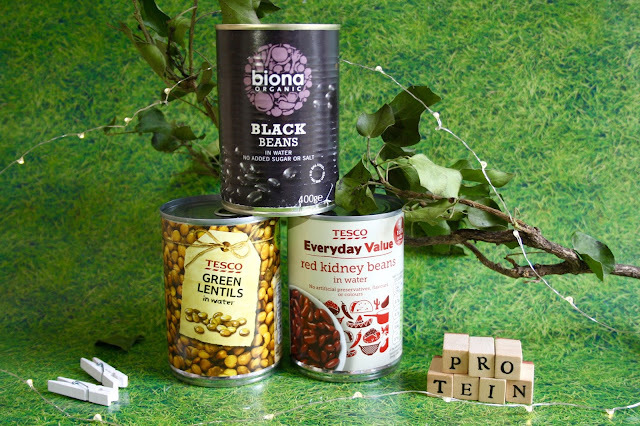 I simply mix a tin of black beans, a tin of kidney beans, and two cans of chopped tomatoes with some seasoning to create a delicious vegan chilli, which I serve with brown rice. 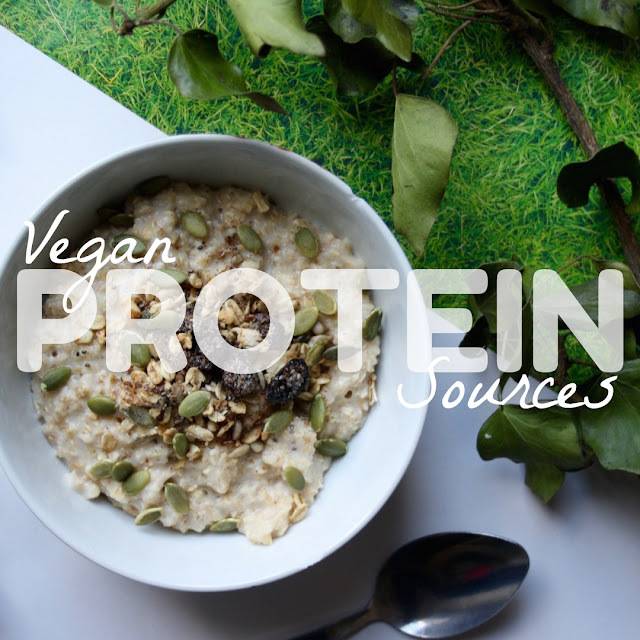 Protein-rich snacks are another fantastic way to pack this essential nutrient into a vegan diet. Quinoa is a great source of complete proteins - no need to combine multiple sources here - making Perkier's quinoa bars the ideal lunchbox treat. When they taste as good as the cacao and cashew variety, you really can't complain! 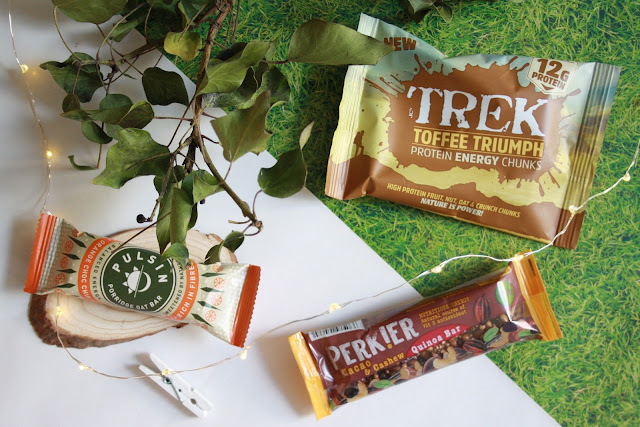 Trek's Toffee Triumph protein energy chunks are another delicious choice, very moreish and easy to snack on throughout the day. Even more options are available from Nutree Life, a company which specialise in protein heavy products that don't skimp on taste either. Their vegan protein bars come in flavours as diverse as sticky toffee to lemon chia! Another personal favourite of mine are orange choc chip Pulsin bars, which honestly taste just like a Terry's Chocolate Orange! Oats are a good source of protein and Pulsin bars have this in abundance. As we saw in the last paragraph, protein can be obtained from oats. They also make for a very filling breakfast. 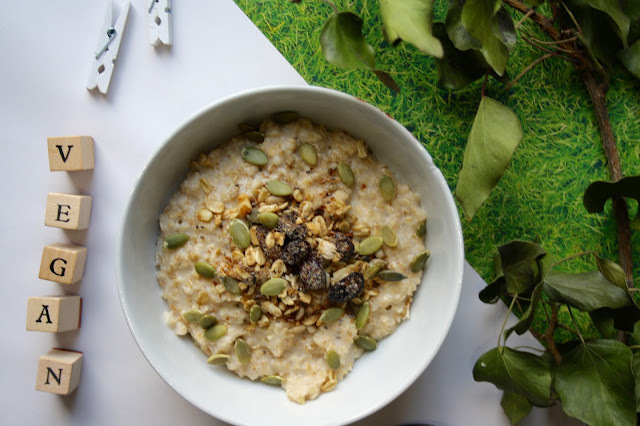 I love making oat porridge using the KOKO coconut milk that I mentioned in my easy vegan swaps post, and this always keeps me full 'til lunchtime. For an added protein kick in my porridge, I sprinkle some sunflower seeds over the top. As well as being high in protein, sunflower seeds also contain a high concentration of healthy fats, which your body needs to function day to day, and plenty of magnesium and zinc. Pictured above is what I call my "posh porridge", which is topped with granola, dried cranberries, and chia seeds as well as sunflower seeds! Go Nuts for Nut Butter! Another food to be added to our list of complete proteins is peanut butter. 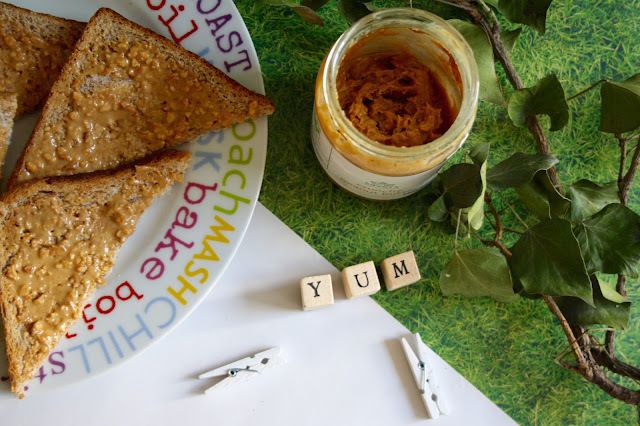 PB can be enjoyed on toast, in a sandwich, as well as mixed into porridge (something which I adore). Some people may avoid peanut butter because of its high fat content, but peanut butter's abundance of "good" monounsaturated and polyunsaturated fats means that it's a far healthier option than saturated fat rich foods like crisps. In addition to this, research has suggested that eating peanuts can help reduce your risk of diabetes, heart disease, and other chronic health conditions. The benefits of peanut butter go way beyond the protein! What snacks have you been loving lately? Comment your favourites below - vegan or non vegan suggestions equally welcome! Have you met my February advertisers? *This blog post was sponsored by Nutree Life.